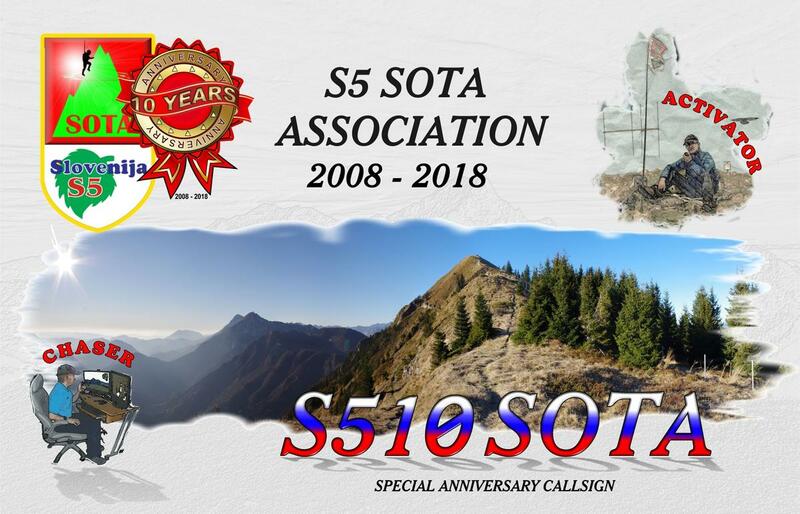 This year, 2018 , Slovenia SOTA program celebrates it’s 10th anniversary. With this purpose will be issused special diplomas and activated special call S510SOTA. Congratulations. Are you planning a event on the big day like we do here in LA? In any case, we have a series of activities in the plan. We will be informed in advance. The first diplomas for SOTA activators and chasers outside Slovenia are awarded. Congrats Luc, Mario and Gerhard. waiting for an activation. Best wishes to you and to the continued success of the Association. Thank you and greetings to you, Gary, you are the first owner of our certificate from NA. Happy New Year to all and lots of nice moments in SOTA activities. tried various like day:month:year 01/01/2018 and 01.01.2018, also 01/jan/2018 don’t work The date format is incorrect. just click with mouse into the date frame (day, month or year, doesn’t matter). Calendar will open, scroll to the month and click on the day. That’s it! Congratulation on your award and Happy New Year! Will try another PC ! I had the same problem but this worked for me. Congrats Don, Eric and Ester. Congrats Rudolf, Kjetil and Efthymios ! Currently, the owners of the S510 SOTA certigicates are in 18 DXCC. Check in the SOTA database, or you also qualify for a diploma.